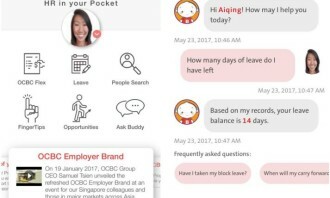 OCBC Bank has launched a comprehensive human resource mobile application, HR In Your Pocket, which includes an artificial intelligence-powered chatbot that is integrated with the bank’s HR information system to provide immediate and personalised responses. This places OCBC as the first bank in Singapore to have launched such an app. According to a media release, HR In Your Pocket was developed in-house and through feedback from employees wanting to be able to access HR information and perform HR-related matters anywhere and anytime, without having to contact the HR team or be seated at their desks. The app will benefit the bank’s employees in Singapore by giving them access to a holistic HR resource centre for leave applications, tracking of employee medical and lifestyle expense reimbursement claims, internal job postings and OCBC Bank’s people directory. It will be rolled out in OCBC Malaysia by the end of the year. 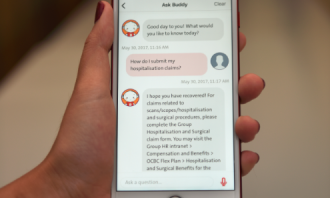 Additionally, the app will feature an in-built chatbot, “Buddy”, which will be able to answer employees’ HR-related questions instantly. 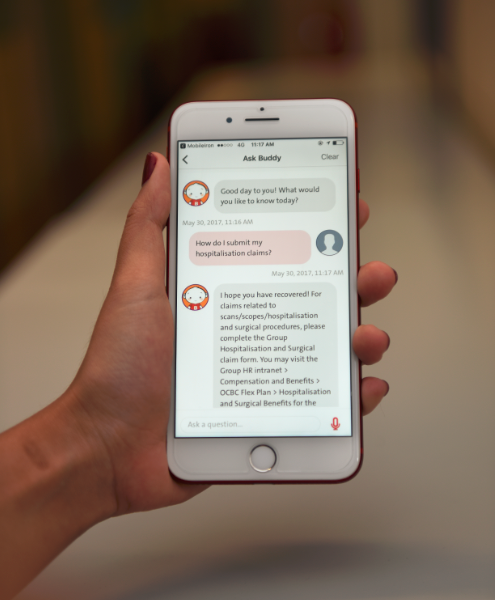 Employees can ask ‘Buddy’ questions by either typing the questions in the chat window or using voice commands. ‘Buddy’ has human-like conversational skills and natural language processing capabilities, and is able to interpret questions and answer them in plain English. Being fully integrated with the bank’s HR system, “Buddy” can respond to individualised questions – for example, annual leave balance or expense claim status – with personalised answers. 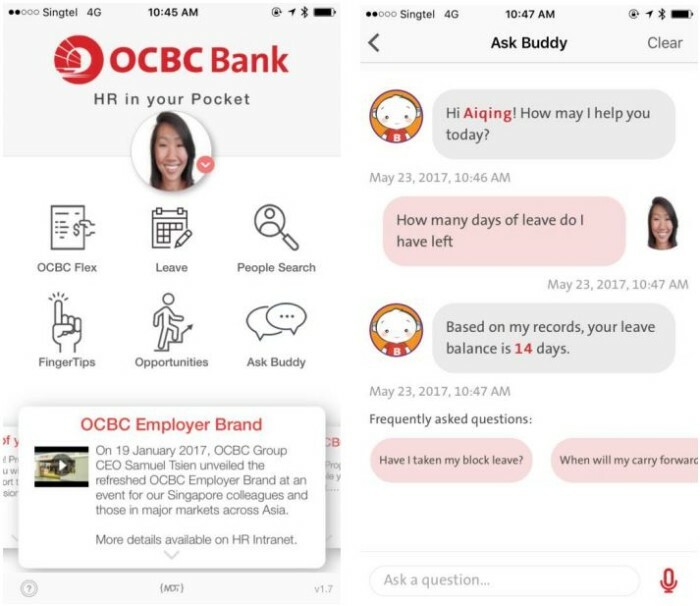 Other questions that ‘Buddy’ can answer include those related to staff entitlements and practices, HR policies and OCBC Bank’s employee code of conduct. 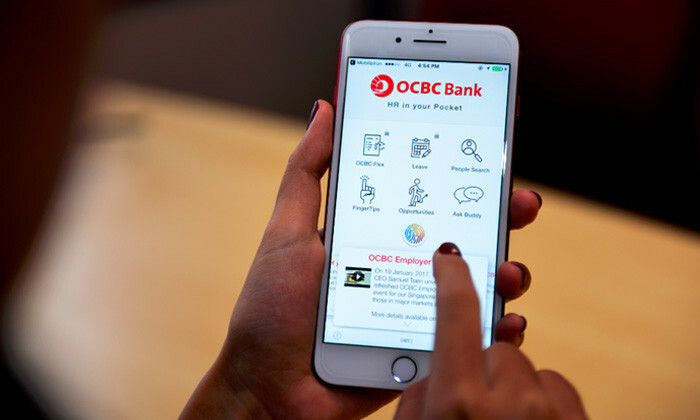 OCBC Bank employees can access HR In Your Pocket with OCBC OneTouch which leverages Apple’s Touch ID technology to enable employees to log in to the app using fingerprint recognition. Jason Ho, head of group human resources, OCBC Bank, said: “We are always exploring new initiatives that make employee experience and engagement superior. These initiatives, including the development of HR in Your Pocket, are often moulded with input from our employees. The HR app and ‘Buddy’ was developed in-house by the bank’s dedicated team of five mobile developers in collaboration with the HR team. Adopting the Agile project management approach, the team has the flexibility to continuously improve and respond to changes or feedback instead of following fixed processes. As a result, they were able to expedite the whole development process, with both the app and chatbot completed within two months instead of the typical five months that chatbots in the market typically require. Praveen Raina, senior vice president, group operations & technology, OCBC Bank, said: “The app helps to boost productivity as it frees up resources and time that could be used for other purposes. While HR In Your Pocket is currently available on iOS devices only, it will soon be rolled out on Android devices. Plans are also in place for the next phase of development for the app, for instance by integrating it with the learning management system so that employees can apply for courses and track their learning and development journey through the app. The first rule of Break Club is: Don’t talk about Break Club (unless you want to be a good boss and give your employees a chance t.. Insights from study show collaboration and transparency are the keys to retention for HR, as skills shortages make hiring more dif..
Local leisure activities, recommendations to save money, and a local SIM card - these are some of our favourite things during work..